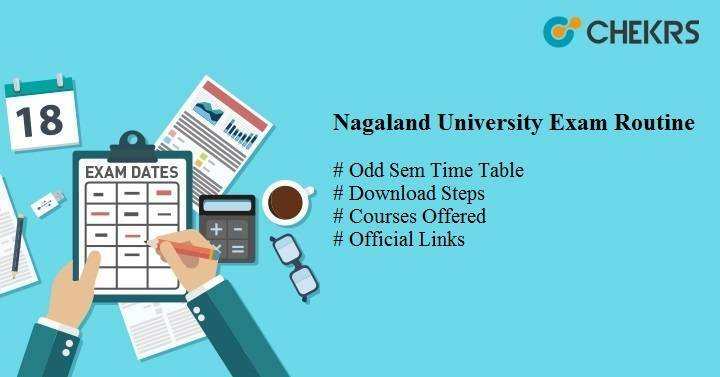 Nagaland University Exam Routine 2019: Students of the Nagaland University are required to know about their examination schedule. The university is all set to ready for the conduction of the exams. Latest Update: Examination routine for 1st, 3rd & 5th-semester examination 2019 of llb courses has been released. Download it from the table given below. The university organized the exams of both the courses i.e. UG (BA BSc BCom etc) and PG (MA MSc MCom etc) in semester format i.e. Even (2nd 4th 6th) and Odd (1st 3rd 5th) sem. The odd semester exam is conducted in the month of Nov/ Dec while the examination of the even sem is conducted in the month of May/ June. The students who newly taken the admission in the university faces the problem in seeing their examination schedule. So for sorting their problem, we are providing here the all the details of the Nagaland University Semester Exam Schedule 2019. Students who don’t know the process to see their examination schedule can follow the steps given below. Through these steps, students are able to see their examination routine. We are providing here the steps from which the candidates are able to see their Nagaland University Exam Time Table. The steps are given below. After the official site, an open student requires to go to the “Student Corner” section which is available on the left-hand side of the official site. Under the “Student Corner,” there is a link name as “Time Table/ Routine”. Student required to click on it. After clicking on the link, a window will appear under which the various links of the examination with the name of the program and semester is given. Students require to choose the name of which they want to see the time table. After that, they are required to click on the link name as “view Routine” /”View Notification”. Students who are not able to get their time table from the above steps they can access it from the table given below. We will provide here the link of the Nagaland University Time Table 2019 for each and every course after it will release officially on the official site. So students have a good opportunity for the preparation of their exams so that they are able to obtain good marks in the exam. Every year a large number of candidates appear in the entrance examination of the Nagaland University. Students who clear the entrance exam and want to take admission in the university is required to select the course according to their interest. The university offers courses under the UG and PG program. The list of the Courses Offered By Nagaland University is given below. The Nagaland University was established in the year 1989 through the Act of Parliament India. It is a central university located at Lumami, Zuheboto, Nagaland India. The university also affiliated through the UGC. Through the university, there is 66 colleges are affiliated.